We had a long chat with Eric Stecker, Berger Bullet’s Master Bulletsmith. Eric had some interesting revelations. First he noted that Berger’s production in 2009 was up 50% compared to the previous year. Berger is now running 24-hour shifts to meet demand. And Berger isn’t resting on its laurels. A new .338 bullet is going into production, and Berger now has the means to produce .416s and even 50-caliber bullets. Berger also has multiple new prototype long-range bullets in development. Eric let me look at them and hold them but he requested that we NOT publish photos as the bullet profiles are somewhat radical. Eric revealed that a new series of short-range 6mm bullets in the 60-grain range are probably going to be released later this year. These borrow some design ideas from the successful Euber FB bullets, with refinements to improve ballistics. 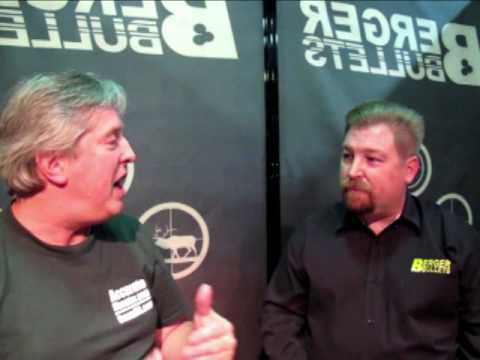 We covered many other topics during our interview, including the status of the new Berger Reloading handbook, and the differences between the G1 vs. G7 Ballistics models. Click on the video link below to learn all the latest info from Berger. Share the post "SHOT Show Report: Berger to Release .338 and new 6mms and Load Manual Nears Completion"
I would like to see the new reloading manual in a loose-leaf binder with laminated pages so that we can purchase updated information to put directly into the binder instead of having to purchase a new book every other year. I currently use the 7mm vld projectiles for both hunting and target, and have recently put together a 338 lapua, now just waiting for the 338 bergers….been waiting for a year now but nobody seems to know when they will be available. ITS THE NOT KNOWING THAT HURTS THE MOST. might have to get another thousand SMK’s.